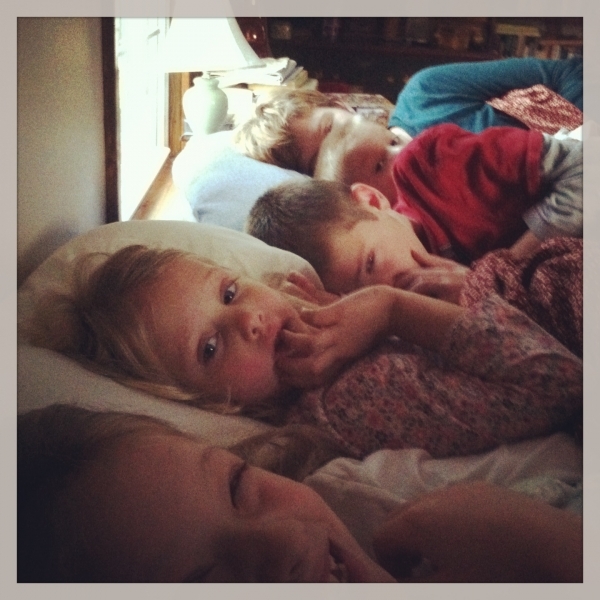 During a recent trip to God’s Whisper Farm, I woke up in the morning to discover that our four kids had invaded the bed. After a few hours of waiting, I sent my wife a text message. The phone rang moments later. I picked it up. I felt like I was in a movie because suddenly, surprisingly, the words wouldn’t come out of my mouth. Eventually, I asked, “So what happened?” But even before she said a word I knew what the results had been. “They couldn’t find a heartbeat,” she said through quiet sobs. I thought about the previous fall, when Maile had miscarried her last pregnancy. I thought about the tiny mound of rocks and the barely-held-together cross we had made out of branches. I thought about the tiny box now buried in the cold ground under the snow, the box that had “HOPE” inscribed on the top. I thought about how we had just about finished paying for that last miscarriage. The last monthly bill had arrived from the hospital, and the balance would be gone after one more payment. Not that this had anything to do with money, but the irony was sharp, that in the same month we finished paying the bills associated with one miscarriage, we could very well begin paying for the next one. How many times do those words appear in the Bible? God says that phrase to Abraham multiple times, reassuring him of the promise. Joseph says it to his brothers when they discover his identity. Moses said it to the people. God said it those same people. Nearly forty times that phrase appears in the Old Testament. I told the kids while making their macaroni and cheese. “I don’t want the baby to be dead,” Sam said, now on the verge of tears. A few minutes later, I heard the car pull down the lane, tires crunching over cold stones. They ran to the door and when she opened it they engulfed her. The cold air blew in around us. The last instance of Do not be afraid appears in Revelation, as John falls prostrate after seeing the source of the voice speaking to him. The Bible says he fell as if dead. But He laid His right hand on me, saying to me,“Do not be afraid; I am the First and the Last. I am He who lives, and was dead, and behold, I am alive forevermore. Amen. And I have the keys of Hades and of Death. Do not be afraid. I am the beginning and the end. I hold the keys to death. After a few calls, we found a medical center that could do a scan for us that evening. We drove straight there, passing houses at that particular time of night when Christmas lights are coming on. I dropped Maile off and took the kids for dinner. The sun set over white, snowy fields. Cars crept into town, towards the malls and the shops. We sat in the sandwich place and the kids chattered and ate and laughed. Then, out of no where, Sam looked at me with sad eyes. “I don’t want anything to die,” he said. Then, much quicker than I expected, a text came through from Maile. I didn’t want to look at it, but I had to. We’ve mourned a lot in the last year, lost friends (too young) and a grandmother and seen things I hoped I’d never see with my own eyes, seen things I’d hoped I’d never be this close to. Only a year ago I wasn’t sure if I could keep writing for a living. But there have been moments of peace, too, peace that cannot always be explained. There have been small patches of joy that, when stretched, surprised us and became more than adequate to fill the gap in the cloth. This is life, isn’t it? The goods and the bads. Ground gained and lost, and, sometimes even worse, the battles that stretch on for months and years without any sign of a clear winner. But this is life. Celebrate with us today, will you? And, when we need it, as I’m sure we will again, come alongside and hold us up. “We have a baby!!!! !” the text message said. The kids and I pulled to a stop outside the medical center. It was nearly vacant, and a lone individual stood along the curb, smoking a cigarette. The van smelled of sandwiches and a cold winter’s night. We watched through the glass. They practiced their scream. Then we saw her. She came through the dark night, opened the door, and held up the ultrasound photos, smiling like I hadn’t seen her smile for many years. The sound of those kids’ joyous rapture was quite a sound to behold. It probably scared that lone smoker nearly to death. To me the sound was as good as a host of angels, and words came to my mind, through the cacophony. “So there’s going to be a number five,” I said, grinning. But my voice was drowned out by another round of cheers from the back. I’m currently running a Christmas giveaway (ending Wednesday at midnight) where you can win an advanced copy of my upcoming book with Tim Kreider, Refuse to Drown, as well as copies of five other books I’ve written or co-written. You can enter the drawing HERE. So happy to hear the news. It feels like it was just yesterday I hitched a ride with you guys to Atlanta and we talked about this. Ive been keeping tabs on you all and had to check in on this blog first thing this morning as I had a feeling this would be the announcement. Congratulations! As 1 of 5 kids I have to say that its a magical number. Praise God. What a fun road trip that was. I never did quite get all the dirt I was hoping to get on Bryan, but oh well, maybe next time. Thanks for the congrats. I KNEW this would be your announcement! Congratulations and hugs to all! So beautiful. So exciting. Happy tears. Hope. Peace. Thanks, Mary June. We value your friendship. Tears of joy for you, Maile and Shawn and adorable kiddos! Congratulations! Thanks so much, Amber. Our love to your family. That is great news. And a really encouraging post! Thanks for sharing, Tammy. I hope you guys are doing well. Wow! Congrats Shawn. What a blessing! And what a well written post. I was on the edge of my seat, haha. Haha yeah Tanya said she sees you in there quite a bit. I’ll see if they are hiring. Tears of joy streaming down my cheeks for you guys KNOWING the struggle can be rough. Congrats! Praying for healthy mommy and baby!! So when exactly are you due? Thanks, Karla. We’re due the end of June. You guys. I’m crying here.. I’m so excited for you! Praise God. Beautiful. Praying for you guys!! What precious precious children you have. Congratulations. Actually, Carol, the fifth head in the photo is my wife, hiding. Thanks for the congrats. Thanks, Leanne! I heard you. Congrats!! What a great early Christmas present for you and your family. Excellent writing here, Shawn! It IS life. And I am celebrating it along with you and your wife. I’m in the backseat with the kids jumping for joy and shouting with hope. Thanks, Rebekah. I appreciate your kind words and your co-celebration. I am joy-filled for all of you! Congratulations and Merry Christmas! Merry Christmas to you, Michelle. I love the message, “Do not be afraid”! Thank you for that message, I needed to hear it today. Congratulations on your baby! “Do Not Be Afraid”…it’s a good reminder, isn’t it? Thanks for commenting, Laura. This is so beautiful!! Seriously beautiful. And I love that your kids all crawl in your bed. My kids sleep in our room every weekend – on the uncomfortable floor. My oldest is 13 – and she still wants to be with us. Love love love. Saturday mornings at our house are a free for all, too. Hopefully that won’t change for quite some time. Congratulations on the baby, and thanks for sharing this with us. It’s the happiest thing I’ve read all week. I’ve been thinking about this, James. I often feel that I need to write about heavy things, because that’s where people are who need encouragement. But I think it’s good to write happy stuff, too. You’re not the only person who has commented on the happiness side of it, and it’s got me thinking. This is beautiful, wonderful news! Tears here, rejoicing with you! Thanks, Kris, for reading and for celebrating with us. Beautiful. So very beautiful. I’m rejoicing with the heavens, with my very own: Glory to God in the highest. This is wonderful, splendid, and just awesome news!!!!! I am so happy for you all!! You are so right on when you said that there are moments to celebrate and moments when we need for someone to come alongside us and hold us up. What a beautiful story you shared of your family, Shawn. Your children are so precious, and your dear wife, what can I say? You are one very blessed fellow, my friend. Thank you for sharing the good news with us! Congratulations on another Smucker!!!! Amos and I are so happy for you, even though I have a lump in my throat. I love this. I love this post. Thanks man. Aw, shucks. Such a well-written story and with a happy ending, too. Congratulations, best wishes, will continue to pray for a healthy babe and mom. Wonderful news! Beautifully written and many congrats. Found your post via G+. Grateful to have one happy, healthy child but in the last year said goodbye to 2 others too soon. Hoping for a happy ending someday similar to yours. I think my son would scream with joy like your children did. He asks and even sometimes prays for a sibling. Anything in God is possible. Many blessings for a healthy pregnancy and beautiful new addition soon. So yes, thank you again for sharing as this is a story full of hope while at the same time containing loss and i am sure there are many who will find great relief and strength from it. And much love and celebration with you for number 5! Such hauntingly beautiful images through out… but overjoyed for you and yours. I love a happy ending. We’re so happy for your family! Whoot! So happy to hear the news! I don’t know who you are, found your blog off of another blog, but I rejoice with you and your very special news. It pays to get a second opinion and to be also real in your feelings too. what a special ‘story’ for your children to remember. God be with you all. Although I do not “know” you personally, I have so enjoyed reading your blog. I was so glad to read this post. May God be with your wife & this little one in the days of growth & development ahead. And keep writing! Each post is such a blessing to read! Have a most blessed Christmas!